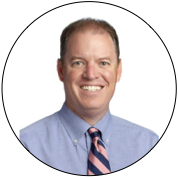 Tim has over 20 years of experience in education, having served as a teacher, vice principal, division head and head of school. He possesses extensive supervisory, marketing, recruiting, and administrative skills, and is well versed in board, curriculum, development, finance and strategic planning issues. Upon graduation from Villanova University with a degree in business administration, Tim participated in a volunteer program, placing recent college graduates in inner-city schools. He taught 5th grade in the Mission District of San Francisco while earning a Master’s Degree in School Leadership from the University of San Francisco. During his final two years in the Bay Area, Tim assumed the role of vice-principal in addition to his teaching responsibilities. After four years in California, he moved to the Seattle suburbs in 2002, continuing his work in the classroom, but this time in a vastly different educational setting - an independent school for gifted students. In this setting, Tim’s passion for and commitment to gifted education took shape, as he immersed himself in this wonderfully unique form of special education. A big believer in the intersection of opportunity and hard work, Tim was named founding Middle School Head at Open Window School in Bellevue, WA in 2006. In this new role, he was charged with designing all aspects of a new middle school program, including curriculum development, student recruitment, marketing and hiring. After an initial 6th grade class of 11 students, the middle school grew to well over 100 students by the time Tim left in 2013. The middle school served as a model in project-based learning, with a commitment to community partnerships, service learning and off-campus experiences, culminating with an 8th grade international trip to Costa Rica. With a strengthening tug of family motivating a move closer to his east coast roots, Tim explored several headship opportunities from Connecticut to North Carolina. However, it was not until he visited Science & Arts Academy that he found the right fit both personally and professionally. SAA’s mission aligned with Tim’s educational beliefs and the school’s commitment to gifted learners resonated as both a parent and an educator. From the first time he entered the warm and inviting campus, the school’s welcoming community felt like home. Tim was named SAA’s seventh head of school in late 2012 and officially assumed the role in July, 2013. During his time at SAA, the school has grown in both size and reputation, and is a leader in the gifted independent school community. From a commitment to social and emotional learning to ongoing faculty and staff professional development, SAA remains steadfast in being The Gifted Choice in the Chicago area. Tim is also active in ISACS, the Independent Schools Association of the Central States, serving on multiple accreditation teams and planning committees. Tim is an avid sports fan, especially of all four professional teams from Philadelphia, where he was born and raised, as well as Villanova basketball. He has also embraced the Cubs as his second favorite baseball team. Tim also enjoys traveling, with a special fondness for road trips and visits to national parks. He and his wife Ana, an active member of the parent community, are proud to have all four of their children at SAA.